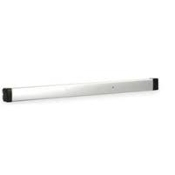 Door Height: Standard unit adjustable for doors up to 66” above the selected bar height. For doors over 66” above bar height, up to 10 ft use 8655 Tall Door Kit. Door Thickness: Suits 1-3/4” standard, up to 2-1/4”. Device requires modification when used with cylinder in doors over 1-3/4”. Stile Wall: Doors with stile walls other than 1/8” require modification. Cylinders (available separately): See CYLINDERS for cylinder make, thumbturn and trim ring information. Bolts and Strikes: The patented top latching mechanism utilizes a rotating top bolt which deadlatches around the header strike, interlocking the door to the frame. Supplied with standard header strike. The hexagonal, hardened steel bottom bolt is shielded in a cast housing for strength and stability. Electric Latch Retraction: The LR option uses a solenoid mounted in the pushbar for instantaneous unlocking and locking of the exit device from a remote location or access control device. LR option is not available on rim type exit devices (see EL option). Alarmed Exit Device: This battery-operated option emits a loud (95 decibel) alarm to notify management of unauthorized exit. Available on minimum openign width 36". Cannot be ordered with other exit device options. Request to Exit (REX) – Monitor / Signal Switch: Mounted in the exit device pushbar on the hinge end, the switch can be used to activate signal light, horn, monitor, or other devices.